Find hotel near Gran Caffe Principe Di Na ..
A typical friendly little Italian café in Bracciano, Gran Caffe Principe Di Napoli is a cozy spot, perfect to hang-out with friends and savor delicious Italian food. 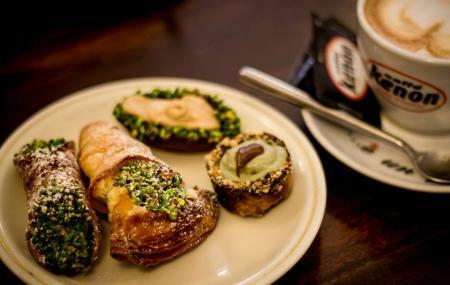 Reasonably priced and offering a good spread of authentic Italian food, including tasty pastries, ice creams and beverages, this café is quite popular among the young crowd. The friendly staff and the prompt service definitely add to the experience at this place! Make your visit suitable to your interest, use Bracciano trip planner for personalization. You won't miss your home when in Bracciano, hotels in Bracciano like Grand Hotel Terme Di Stigliano, Antico Borgo Di Sutri, Albergo Della Posta and Hotel Da Vittorio offer some of the best places to stay in the city. Generate executable plans on your own or book the top rated Bracciano vacation packages for your visit. Read more on how to reach Bracciano. Love this? Explore the entire list of places to visit in Bracciano before you plan your trip. Fancy a good night's sleep after a tiring day? Check out where to stay in Bracciano and book an accommodation of your choice. How popular is Gran Caffe Principe Di Napoli? People normally club together Parrocchia Santo Stefano and Osservatorio Robotico Astronomico Orioloromano while planning their visit to Gran Caffe Principe Di Napoli. Best coffee ever and all around.. Not even in Napoli was the coffee so delicious and special as is at Nando's & Carmella's and their workers are a pleasure, delightful, great service..amazing flavours to delight your pallet and put up above the clouds in pleasure! Best icecream in Bracciano and lovely owners and staff. My daily to go to coffe shop. Lovely place and wonderful castagnole! Un classico caffè del centro. Molto ben arredato. Una moltitudine di te ed infusi. Prodotti di pasticceria di qualità. Non ho provato il caffè ma mi fiderei. Vendono anche cialde e capsule, penso, dello stesso caffè che utilizzano nel bar. Hanno anche una varietà di gelati artigianali, anche d'inverno, che non ho avuto il piacere di provare ma ci tornerò appositamente.